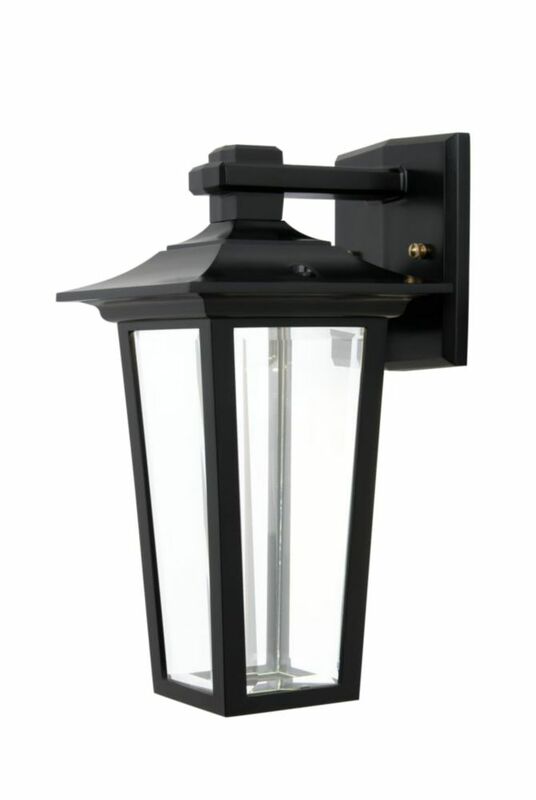 Jazz 7 Watt Integrated LED Cast Aluminum Wall Light Black. This Jazz7 watt LED wall light from Snoc is sure to impress your visitors while greatly reducing electrical consumption. Environmentally friendly containing no mercury. This product is made in Canada and comes with a lifetime warranty. Durable poeder coat finish resists peeling. Maintains original light output for a minimum of 15 years. Fully enclosed wall lantern with clear beveled edge glass provides bright area lighting across porch and patio. Decorative top ring welded on for full support. Made with weather resistant brass. Hardwire installation required, instructions and hardware included. The Gama Sonic GS-122 solar barn light is a stylish outdoor LED light that adds distinction to your home, shed, barn, greenhouse, storage unit or garage. The rustproof cast-aluminum light fixture sports a matte brown powder-coated finish, a glass dome that looks hand blown with its attractive bubbled appearance and a gooseneck wall mount. It mounts easily on any surface, and no electrical wiring is required. At dusk, six bright-white integrated LEDs will turn on automatically and shine at a brightness of 120 Lumens for up to eight hours on a full solar charge. The barn light's monocrystalline silicon solar panel measures 7-inch long and wide and 1/2-inch thick. It is protected by weather resistant, cleanable tempered glass that helps ensure the panel's long-lasting reliability. The light's replaceable, plugged battery pack is good for about 1000 charges. The Hampton Bay Wall-Mount 1-Light White 8-Inch Round Bulkhead Outdoor Light has a protected, grid-encased frosted glass in a round design that's reminiscent of ship bulkhead lights. Install it inside or outside, particularly among front porches, laundry rooms, common areas or any application that requires a low-profile, rugged design. 7 Watt Integrated LED Cast Aluminum Wall Light Black. This Jazz7 watt LED wall light from Snoc is sure to impress your visitors while greatly reducing electrical consumption. Environmentally friendly containing no mercury. This product is made in Canada and comes with a lifetime warranty.